Good morning and welcome back. I've got a busy week ahead with two trips to the airport on the calendar, so let's not waste any time and jump right in to our objective review of the state of the market and our major market indicators/models. 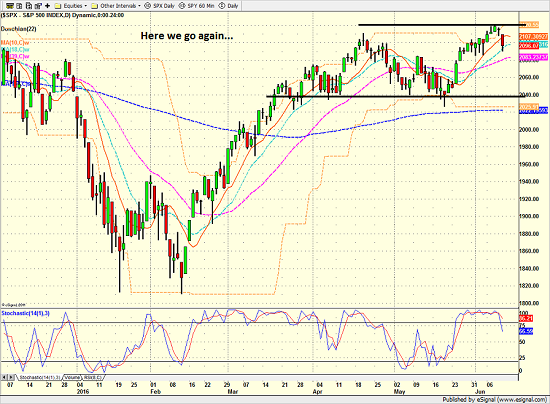 After an all-too brief break above 2100, it appears that the "breakout fake-out" is back in play. So what else is new, right? And after this weekend, we can add terrorism to the list. Our hearts go out to the people of Orlando and the LGBT community. So, from a short-term perspective, the situation is simple: Here we go again. The first level of resistance is 2080 and then 2040. The near-term pullback doesn't change the longer-term picture at all. While I should leave this bullet point permanently on the list: The song remains the same - the long-term, sideways range continues. 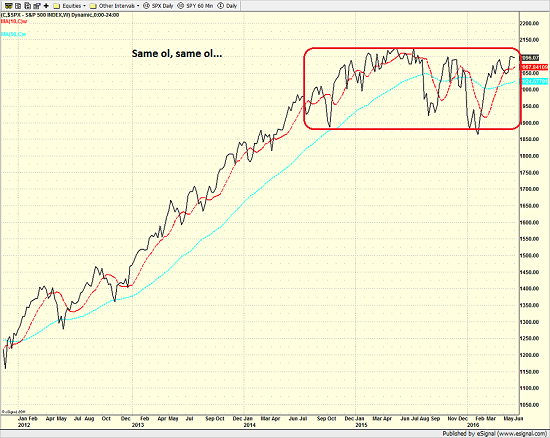 A break below 2050 on the weekly chart would embolden definitely the bears. However, note that the 200-day MA is at 2015 and the 150-day MA is at 2022. Why do we care, you ask? Actually, we don't. But these are he moving averages the press and the so-called experts focus on. Get ready to buy the dip. No, seriously. The good news is that pullbacks haven't produced much pain of late. The bad news is the board is now neutral at best. The good news is our cycle composite continues to suggest higher prices into mid-July. Should the market continue to decline, we will note that our channel breakout systems triggered a timely sell. 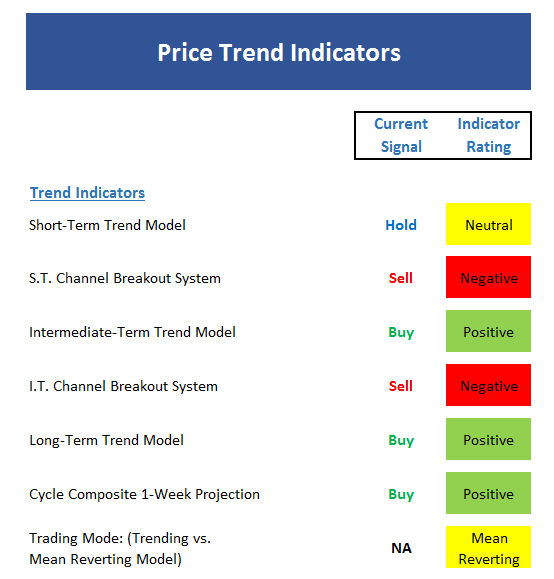 Our trending vs. mean reverting models also did a good job of telling us that the "breakout" was suspect. I'd get ready to buy the dip. Oh wait, did I suggest that already? The momentum board is neutral to moderately positive. But I'd lean more toward the neutral side here. The trend & breadth confirm models are split - as expected. The industry health model upticked to moderately positive this week. However, it did so by the skinniest of margins. The volume relationship models are also split. However, we note that both have been in uninspired modes for some time now. 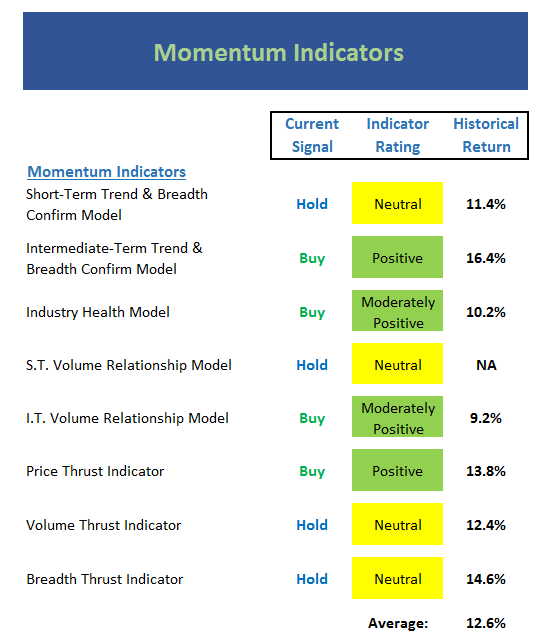 The thrust models are suggesting that momentum has waned. However, the current historical return of the board remains above average. The message from the early warning board is clear - there isn't a green box to be found. 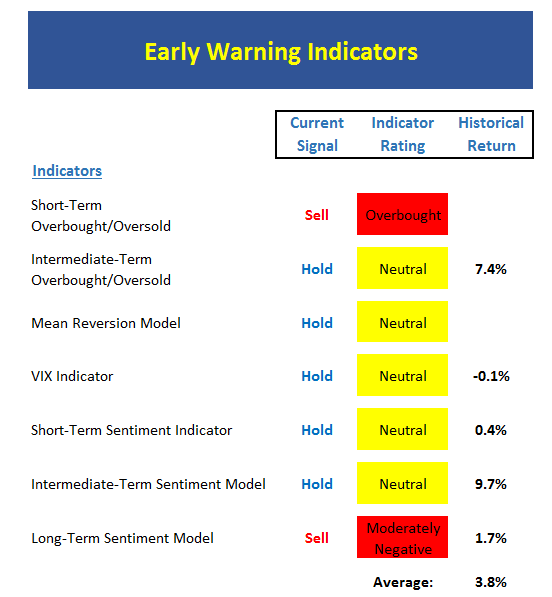 The VIX indicator gave what appears to be a timely warning signal. This board is an example of "mean reversion" work at its finest. The goal is to be the most bullish at the bottom of declines and the most bearish at during extended advances. My personal mean reversion model went negative on Thursday. Not bad. And yet, there are changes this week as our absolute monetary model flipped to neutral. And since 2007, the average return when this model is neutral isn't good: -3.7%. When you combine the average historical returns of the two monetary models, you come up with +0.45%. The takeaway here is that the monetary tailwinds in the U.S. have definitely stopped blowing. However, the ECB and the BOJ continue to print money and "but stuff" like it's going out of style - producing negative interest rates in a BUNCH of places. The macro thinkers suggest this won't end well. But then again, the macro crowd hasn't had much to crow about since 2008. The overall average historical return for this board is now just +2.1% per year. Obviously this is well below average. 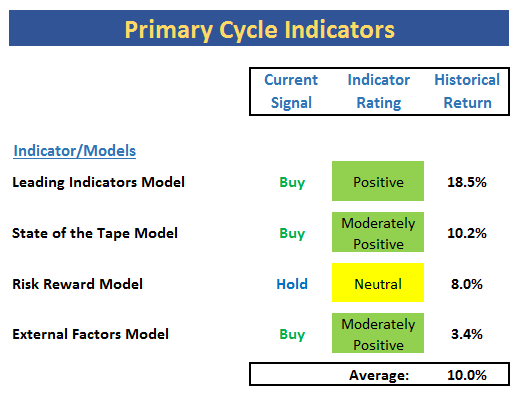 Our leading indicators model, which did a great job of calling the weakness and then returning to a positive mode after the January/February swoon, has pulled back a bit. But the models remain well into positive territory. The state of the tape model is now positive, but as I mentioned above, by only the slimmest of margins. The risk/reward model remains neutral. And in looking back, this model has done a stellar job of calling the overall environment. 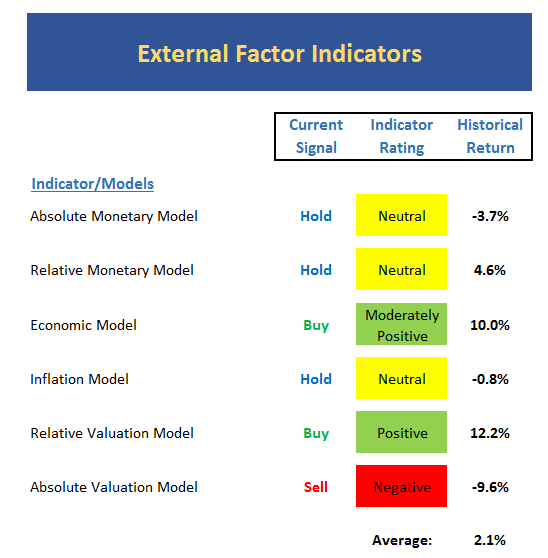 The external factors model has also pulled back (due to the weakening monetary conditions). The overall rating remains moderately positive. The historical rating sits at a nice, round 10%, which is about the historical average for the U.S. stock market. Stocks reversed the April/May pullback with a May/June rally. But unfortunately, the rally's momentum has waned in front of the big, bad events (and the weakness in the economic picture). So, it isn't terribly surprising to see stocks begin to pull back. The good news is our cycle composite suggests that the current rally has a way to go yet and there aren't any glaring problems on the indicator boards. In fact, the models suggest that stocks are biding their time, waiting for the uncertainty to clear. The question, of course, is when and if this will happen. So, the bottom line is we expect any pullbacks in the near-term to be shallow. And since we continue to believe that U.S. stocks remain in a secular bull market, the appropriate response is to... wait for it... buy the dips!